In recent months, tiny Linux boards have followed the march of technology and become ever more capable and less expensive. The purest expression of this is the C.H.I.P., the $9 single board Linux computer that made waves simply for how inexpensive it is. The Raspberry Pi Zero is even cheaper, and looking at the spec sheet, is even more capable. The core of the Raspberry Pi Zero is the Broadcom BCM2835 – the same system on chip found in the original Raspberry Pi. This time, it’s running at 1GHz, – 40% faster than the Raspberry Pi 1. There’s 512 MB of RAM in this board, and of course like all Pis the standard 40-pin header is included. Building such a small board meant the Raspberry Pi foundation needed to cut a few ports from the Zero. Ethernet and the quartet of USB ports found in the Pi Model B+ are gone; there’s simply nowhere to put them. Instead, the Pi Zero includes a mini-HDMI socket, and two micro USB ports – one for power and data, another for USB OTG. Composite video remains on an unpopulated header, and storage is through a microSD card slot. In the years since the release of the Raspberry Pi, it has become the defacto tiny Linux computer. A few contenders to the throne have shown up, though, with the most interesting being the smallest. While the Raspberry Pi Compute Module isn’t much of a success, we’ve seen a lot of tiny boards like the ODROID-W, and Carambola finding their way into the coolest projects. Part of this is the size of these modules, being able to fit into anything is a big bonus. With a price of only $5 – and without $20 in shipping that the C.H.I.P. was criticized for – the Pi Zero is going to be a very, very popular board. The Raspberry Pi Zero should be available from the usual vendors – Element14, The Pi Hut, Pimoroni, Adafruit, and Micro Center – starting today. If you have a subscription to Magpi, the official Raspberry Pi magazine, you’re in luck: the December issue will include a Pi Zero right on the cover. Innovation at it’s finest, ladies and gentlemen. Punctuation and capitalization at its worst. I actually love grammar Nazis. I think of it as code review for plain English. I say this with the greatest respect for team rPi; but arguably their virtue is not innovation; but optimization and production. Single board computers, ARM and otherwise, are downright ancient; but historically came with a fairly nasty case of sticker shock(I’m pretty sure that I paid $100 for my NSLU2 ‘slug’ to run debian; and that’s because it was a killer deal at the time); and anything with actual headers and documentation was “Oh, evaluation boards are $3,000; but come with a crippled version of our proprietary IDE!”. Now, in large part thanks to team rPi; this is no longer the case. You can get, from them and others, the amenities of a dev board for the price of a mass market device. This isn’t architecturally novel; but the fact that it is now cheap and readily available is. You’re absolutely on the money — James (does the layout for Pi B+ onwards) said to me that he thought the hardware itself was trivial, the difficult part is getting the cost down. When you sell a computer for $35, and the distributor, assembler etc have had their cut, there’s not much money left for silicon. IIRC there’s actually something like $6 worth of silicon on the Zero, but lots of effort went into making the board as tiny as possible, and it’s a single sided load (parts on one side, cheaper to assemble). They make a loss when selling it on its own but I think a small profit when selling it with the magazine. You also can’t forget the software (they have paid employees working full time on open source software [UI, kernel + drivers], and pay contractors to do work on open source software like scratch) and the work they do on the education side — they sink a lot of money and employee time into developing educational material and helping teachers get the best out of it. All around a very nice bunch of people, and the hardware is a very small part of their output (although the most tangible). Innovation at it’s finest, ladies and gentlemen! Clearly an accidental double post. Lighten up, turkey breath. CHIP has bgn-Wifi, BT4.0, 4GB storage, Mali400 GPU, DDR3 RAM, but only composite video compared to Pi Zeros (mini)HDMI. A HDMI or VGA daugherboard can be mounted on the CHIP if needed. The CHIP also has built-in LiPo support and should be able to drive most parallel TFT LCDs directly, including some of the cheap ones designed to run off a microcontroller address bus. (Probably LVDS TFTs too.) They basically have different strengths and weaknesses. One of the strengths of the Pi zero is that I can buy it right now. C.H.I.P. is still a preorder. can you buy rpi zero right now? Just bought one 12 hours ago. “Due to high number of order this is temporarily unavailable” kind of buy it right now. And only 1 per person, so considering its almost symbolic price is almost a free pc for everybody might want it. CHIP is also probably vapor. You might want to tell that to the backers who have already received theirs. I have two sitting on my desk. Wafting. They’re wafting on your desk, like good little vapors. Also, CHIPs shipping is now somewhat cheaper but I doubt it will be cheaper than shipping a Pi anytime time soon. Now try to explain me that this is not the coolest thing in SBC world ever. They did it, they supplied computer to everybody. Well…”everybody” once supply can meet demand. Given the historical Pi landscape, that could be months from now. There’s a lot of overlap here with the Pi compute module (though that requires a lot more support electronics); I wonder if they’re thinking of retiring the compute module? I don’t think it is possible to have overlap with a product that didn’t have an application. I count the Zero as an admission that they’ve learned from the past and “zeroed” in on their target market. I can’t wait to get one and I’ll see what the Ste(a)m club at my daughter’s school thinks of them. The compute module is meant for commercial & industrial integration into products. For example, if you want some control over what kind of jacks are on your product. That said, I really don’t know if it made any headway. I think the customers that use it probably don’t want to advertise that it’s in their machine. This thing will require a hub for most uses. I hope someone makes a hub board that matches the Zero’s form factor. USB isn’t exposed over the 0.1″ connector, so any hub would have to use a USB cable as well. And if you need it, why not just buy a regular RPi instead? Using a regular Pi means having to deal with constraints if you wanted to use any of the jacks it offers. The product would end up being more haphazard than the original Pi configuration. It started with the Compute Module, but a flaw in the PCB meant reverting to a “proper” Pi. This version combines the small profile of the Module with the “standard” 40-pin interface. Admittedly, dumping the HDMI for Ethernet would be the way I’d go – but I’m not the designer. I suspect many designs similar to Ben Heck’s calculator (Gameboys, terminals, media players, etc.) may be re-designed to use the newer, CHEAPER, smaller board. Savings in space and money can be invested in bigger batteries, or better plugin cards to handle I/O. Adding a RJ45 with magnetics inside cost less than $1.00 in bulk. So, it is far from tripling the cost. One bluetooth adapter and you will have network, mouse and keyboard connected. No need for usb hub. Bluetooth also serves sound and serial port if needed. Thats how my A+ is currently working. Zero will be a perfect replacement. What OS are you using? How did you configure it? Can’t get Bluetooth audio working on my RPi’s B and 2 under Raspbian. Yeah but it’s +$100, might as well get a regular pi at that point. You could buy an A+ instead. Just because you couldn’t get it for $5 doesn’t mean it’s not available for $5. Got it for 7 CHF with shipping, I think that’s close enough. 5$ is the manufacturing price. Then comes their profit, the profit of the reseller, the price for the adapter and OTG cable, tax, and other costs. No, $5 is the retail price. Well if they are going down the miniaturisation path then energy consumption becomes the big question. The previous generations were not really practical for battery operation. I wonder if power saving comes just from limited peripherals or if it might be a different revision of the SoC? It’s a totally different SoC though right? I’ve not had a close look at previous RPis, but it looks like far more functionality is stacked in the single Broadcomm chip, which should in itself provide power savings. Same ancient SoC as the very first Raspberry Pi, that’s part of the reason why it’s so cheap. I know right. I read about this on reddit last night. Check element14 and it’s nearly $20 before tax. Where does the massive jump in price come from? The exchange rate brings $5US to $6.92A. Canada, where I am, has a similar exchange rate. Then we add 11% duty and 5% sales tax. So $5US becomes about $7.75CDN. Shipping on a single $5 item from the US could kill the purchase especially if the shipper didn’t offer ordinary USPS parcel post. If USPS parcel post isn’t an option, that $5 item becomes a $80CDN item, guaranteeing that I won’t bite. Whatever program China put in place that allows free shipping on $1 EBay items, it has almost certainly been a boon to their economy. Chinese manufacturers have a huge advantage in shipping into the US. They can ship a package into the US for less than half the cost of me shipping a package of the same weight into the next city. The 2010 ePacket deal has lost the US Postal service millions. And makes small-scale commerce between the US and China a one way street due to shipping cost. You won’t have to pay a duty or HST as the item falls below $20 CDN limit. I can’t even find a place that sells to Canada for under $30 a pop for the Pi Zero at the moment. I checked canada.newark.com and sure enough they want $30.54 plus shipping the savages. Currently, US vendors (eg Newark) are also charging way more than $5. Shafting the early-adopters, I guess. I picked up one from Adafruit for $5 and free shipping. Even if we do not have this product in stock individually, it may still be available in starter packs (60$) or budget packs (30$)! Guess so. I just saw the post about it here and then went over to Adafruit and it showed in stock on the $5 ones, so I grabbed one to play with. Usually I miss out on short supply items because of my time zone (posts are generally many hours old before I read them). “Less” is probably what you mean. I guess for the SoC they have already a really good deal from the earlier versions. It could be subsidized. Broadcom and the Pi Foundation are a lot closer than people like to think. oh the intrigue, do share your secret knowledge. Actually dude people don’t think. or care. Broadcom can see that boards are free for years if need be. Gets rid of competition the old fashioned way. It looks like CHIP might have a competitor. Not at all. CHIP has WiFi, Bluetooth 4.0, LiPo support, Mali400 GPU, DDR3. And they’re selling for $8 this week. Might/will eventually have, it’s not released yet. And it costs almost twice as much. They’re not selling at all this week, they’re still pre-order. On their page [https://www.raspberrypi.org/products/pi-zero/] they say the CPU is 700MHz, not 1gig..
Heatsinks are really not needed even when overclocking to 1ghz. A lot of people were able to do this on other Pi 1’s (B, A, B+, A+), but it wasn’t always stable for everyone (regardless of heat), so it was never a default. I would guess that they’ve got a batch of chips that are simply able to handle being clocked to 1ghz by default, and used those for the Zero. I dunno, especially for a board like this where everything is pretty much crammed into one chip. I think I would want a heatsink regardless of if they recommend one or not. I mean pretty much everything on that board that isn’t the main chip is a support component. There was like one other actual chip on that whole board and it appears to be part of the power regulator. Connected to what? Components that use heatsinks have a metal packaging meant for the purpose. The plastic packaging of the SoC isn’t going to be very heat conductive. I guess a heatsink would be better than nothing, but you might be better off still with a small fan running over it and no heatsink. BGA packages like that are designed to use the power plane of the PCB as heat spreader. The heat can conduct through the die to substrate to metal solder ball to copper trace to via. You can easily dissipate a couple of watts. The Raspberry Pi foundation stated that for this device and the original Raspberry Pis that you can run it at 1Ghz over clocked without the need for a heatsink and without voiding your warranty. I wonder how they’re going to recommend getting this thing networked to a LAN, considering the kit only comes with a one-port USB-OTG cable and no 8P8C jack… Oh well just ordered one anyways and I can’t wait to see what becomes of it. Just like the A, that OTG is the way in and out. You can use a hub and network adapter of choice, or connect it to a host PC and use the Linux USB gadget network driver. There’s an SDIO interface on the HAT connector, so if you’re daring you might be able to rig SDIO WiFi to it. The PiZero processor supports 2 SDIO devices; one is used by the microSD for booting, however P1 has SDIO available at GPIO22-27 (15,16,18,22,37,13). Do you know if the SDIO lines on P1 are related to the second SDIO device or are they the same ones connected to the micro SD? And I wonder why nobody uses the “HDMI with Ethernet”. Is there a reason for it? That may solve some problems, isn’t it? I’m fascinated that this interface exists, but yet nobody has done *anything* with it. I haven’t been able to find a single reference to computers successfully connected via the HDMI interface, as a network. I don’t think that’s the intended use case. I believe the idea is that you connect your AV receiver to ethernet, and it acts as a switch for all the attached devices – TV, DVD player, and so forth. Sure, I have no trouble believing that that is the real use case. But why is there so little written about it? That’s my thought, although at the baud rates the ESP normally runs at, it won’t be particularly fast. Good enough for a lot of IoT applications, though. One other thing is driver support. You want a kernel driver so it shows up like any other WiFi interface. It doesn’t look like that exists yet in Linux, probably because there was little reason to until now. When it finally releases, an ESP32 should fix that slowness issue, then again according to their announced specs it’ll be fairly powerful by itself, not anywhere near as powerful as a 1GHz ARM chip of course but plenty enough for a IoT project. Just as same as the A+ and the old A. Configure Wifi then plug module in, it is really that simple to do. Lots of videos on youTube showing how to do this. They should have left out the HDMI and put in some sort of connectivity like eth or wifi. RAM is to scarce to make HDMI usage useful. For a cheap 4$ lcd, there’s spi or some gpio at the pin headers available. But hey, it’s announced at 5$, so 10EUR delivered to my door step in Germany, I’d buy it just to play around. Except that doesn’t make any sense. HDMI output comes free straight out of the CPU, so dropping it gives you absolutely nothing. It’s not like a pizza that you can get two free topping changes on. We’re talking about large volume, low cost here. So dropping a connector, which is a quite expensive part in terms of sourcing and assembly, can give plenty of room for other design decisions (a JTAG, header, IR sensor, RTC, level shifter, … – there are many possibilities). What? It can push a full bluray ISO at 1080 with only 120 MB (probably less) going to the GPU. I wonder much more, why the composite video is still there, but probably it is available on the SoC for free and needs just one soldering point. I see it as an outdated thing, blurry, low res video. Because Raspberry Pi at it’s core is meant to solve a third-world problem as well as first world ones, and that is that computers (of this horsepower range) are outside the price range of many third world schools and amateur hackers. These are the same people who probably cannot afford a $40 used 17″ LCD monitor plus some shipping but they can surely find discarded standard-def televisions. It’s a means to an end. Those NixCores seems to be expensive, Domino.io are cheaper and have more flash. In my understanding the HDMI is built-in support by the GPU. So apparently it costs nothing. Adding WiFi/BT costs a lot more. Well, they must make their 66% markup somewhere! yeah but it doesnt cost $9+ to ship a padded envelope does it? Yes, it frequently does. Feel free to look up shipping rates with the carrier of your choice to confirm. Remember that they need to print a packing slip, pull the item and an envelope, stuff, do UPS tracking info, print label, stick, stack, deal with the UPS driver, deal with returns … That is all human effort, they need to get paid, benefits, taxes, etc. We’ve been spoiled by Amazon Prime, companies that ship “anything for $5”, free shipping, etc. I’m going to guess that Adafruits markup on a $5 RPiZero isn’t a lot. Pro tip: Buy more than one thing at the same time it cuts the overall shipping down. I deal with a parts company that has a min $20 shipping fee. I seldom buy 1 screw, I wait until I need over $100 of material (does not take long), I do the same with Adafruit. I keep a list of what I need (about $40 in the current queue) and when the RPiZero comes back in stock I’ll buy two and spread the shipping charges around. It very well may. But that is entirely Adafruit’s fault. Firstly they decided to be anti-consumer and eliminate anything cheaper than UPS Ground. Apparently USPS loses an unusually high amount of their stuff and if you request USPS shipping the forum mods go off the deep end and list all the reasons they can’t do that. (They also claim switching to UPS-only increased their number of sales and people like the decision… I’m sure that is the reason their sales are increasing….) All-in-all it is comical considering Limor criticized companies in the past for charging a lot to ship small items which is exactly what Adafruit is doing now. Secondly they ship everything from NYC which is not even a remotely good place to ship from when it is your only location and you only use UPS which charges by distance. Wait, refusing to ship with a method that loses a lot of (uninsurable) parcels is “anti-consumer”? Those parcels are insurable, are cheaper, and the selection should be offered. Every major component/electronic-builder online retailer offers the selection except Adafruit. So yes, it is anti-consumer. For a tiny portion of the US they will ship USPS. Everywhere else, nope. ~$14 to ship UPS here. Adafuit is Crazy – They ship from inside the Socialist Enclave of New York City. I’m surprised they can ship for as LOW as $9! And as for Adafuit not using the USPS: Giving your parcel to the Government-run Unionized Post Office in New York City is often tantamount to tossing it in the trash or handing it to a thief. There are many good reasons why you do not want those Government Goons running your health-care and/or public education systems. Unless when you order stuff from china… Which is a real mystery to me. The Chinese govt actually subsidizes shipping to other countries. That’s why you see stuff on eBay with insanely cheap shipping, even air, where I shipped an 11 oz package to France at $30. China Post. They apparently wait until they have a shipping container filled with random stuff from all over then send it, or sprinkle small packages into the nooks and crannies in various containers of stuff. The 2010 ePacket deal has lost the US Postal service millions. Big air cargos or boats, leaving every 2 weeks, doing same route. Mass shipping. Then china Post pays a forfeit agreement for local foreign postage fulfillment, so they don’t have to pay for every package. Essentially they have already paid as you were receiving before you actually bought it, and free postal service is like free healthcare for the chinese government. Customers get annoyed when their packages get lost. Dealing with customers with lost packages takes time/money. Filing for a lost package insurance claim takes time/money. Re-processing an order takes time/money. That money ultimately comes out of consumers pockets. Yet, somehow, taking action to avoid that is anti-consumer? I bought mine from The Pi Hut, and they charged me only $5 to ship. So the total was about $10 (give or take a few cents, since it’s converting from pounds to dollars). It will take a little longer to get to me in the US, but last time I did this it was less than two weeks. No worries, the “5$ computer” it’s actually 17€ on Element14 (plus shipping). Retail margins FTW! it will NEVER be 5$ anywhere, that’s advertising, a few sample at that prices on a few selected sites already gone. people come back and buy it for 20$, just to say they have a 5$ computer. I’ll bet you $10 (that’s two Pi Zeros) that I can buy it for $5 plus shipping somewhere in the next three months. Care to take my bet? I just bought mine for $5 at Micro Center. I purchased one at Microcenter yesterday for $5 (plus tax). I was told there that once the supply issues settle down that it will consistently be available for $5. The zero and a otg to usb cable, including tax, was about $8. 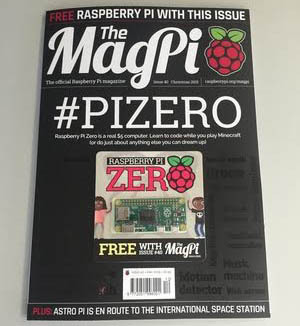 I’m trying to find who sells the MagPi to get the Zero as a pack-in when issue #40 arrives. Just checked the MagPi website – subscriptions start with Jan issue, so you can’t get it from them – Issue 40 is out of stock, likely due to the included Zero..
I’m from South Africa, the price for a Pi $5, price for shipping $60… I think I will pass for now…. looks like every friggin outlet is inflating the price with outrageous shipping or extra needless crap. Farnell in UK £7.99 (+postage). Where is that $5? I grabbed my self a copy of the mag pi at lunch today (Also England) from WHSmithsfor £5.99. Figured it would be cheaper than paying for the shipping from, well, any where that would ship one. The lass on the till said they had sold 15 or so of them already. I arrived at like 13:05. A friend of mine couldn’t get out at lunch and asked his mum to go and get one for him. She got there around 14:00 and they had sold out by then so I must have got lucky! I like the small physical size; I shifted from Raspberry Pi to ODroid-W for that. No joke: this Monday, I finally received my new toy – the CoreWind WiFiG25. It’s even smaller: 50 mm x 30 mm x 5 mm. And it has WiFi, and 3 USB host ports built-in. It’s more expensive, but that’s not my limiting factor. that’s also a pretty bit of kit, what are you going to use it for? Have a look at the nanopi2. http://nanopi.io/nanopi2.html Basically a 1.4GHz Exynos4 SOC (similar to the Odroid-U3) with 1GB of RAM 3.3V, built-in WiFi & BLE for $32. It’s not super small (75mmx40mm)but definitely smaller than an RPI2. I was planning on getting one….but I could get 6 Raspberry Pi Zeros and a Latte instead! or perhaps I’ll get both! Life is good. Wifi,BLE, that’s a must. I will leave 2 17€ PiZero against it. This is a great addition for the raspberrypi-zoo cancer deck to defeat the secret 3d-printer cancer deck that is ruining the meta of hackaday-stone. Ummm……… on element14 it’s $23.3427………. i see a tiny handheld emulator being built in my near future. US$5 becomes AUD$20 on element14, before shipping. That would be a cool project but whast would you do for audio? I read it doesn’t have analog audio. Audio is only thru the hdmi connector. Keen to buy one of theses to control my CCTV camera. Does anyone know if it can be connected to Ethernet and what hardware is needed? You can buy USB-> Ethernet adapters/dongles and a USB-> Micro USB adapter online. Shouldn’t cost too much. Or you could skip the USB-> USB Micro adapter by directly modding the dongle – desolder the USB plug and solder a Micro USB port in it’s place and it should probably work. Best way to get one to Germany is probably importing from UK. If anyone has seen a German retailer, please tell :) I’ve got one from pimoroni, since the pihut paypal API seemed broken. 14,88 EUR without shipping. That’s what I’ve paid at pimoroni with shipping and a case. Same goes with reichelt.de – seems like the 15 Euro mark is set. Why RS is not selling this time? What I like about the ODroid-W is that you can solder on a normal USB-connector. That makes it easy to connect wifi or something like that. I could make a bigger order and ship it out, Lithuanian postal service is dirt cheap. The total would be 5£ delivered for those who don’t mind waiting. But where would you get those for 5$ in the first place.. This will be perfect for wifibroadcast! I was thinking the same… except there seems to be no camera interface? I’ll definitely use it as a Flight Controller for ardupilot though. What does this tell us about today’s embedded products, when the (almost mandatory) cable adapters cost more than the main board?…. That’s not how loss-leader works. just because you have a cable in the drawer, it does not mean that it is free. I have extra cables, but the moment one starts being used in a permanent thing, it is part of the cost of that system. i may be able to get a 35eur RPI and say it is a 35eur computer because i already have all the accessories. But if i wanted 10 of such computers, the cost for one will instantly be at least 100 each. that is why the pi is pretty much a failure for the whole educational thing, if you have to purchase all the accesories, you may be better of buying something else. Raspberry Pi Zero versus Arduino/ Atmega? The product looks great in regards of price and the huge amount of software available for the raspberry. I would really like to forget about Arduino/Atmega-based projects and use a real operating system and cpu, but I still have problems with realtime applications/ easy access to timer. With a PREEMPT_RT Linux kernel you can get (worst case) ~150 microsecond determinacy from user space C/C++ code on the RPi 1. That should be sufficient for many real-time applications. If it’s not sufficient, go bare metal on the RPi or write custom Linux kernel code. There are plenty of examples online. Bare metal is not as easy as you make it sound. The broadcom chip is really not designed for RT applications. I should mention I haven’t dug around in it for a few years but when I last did, trying to get that chip to run RT was a constant struggle with the strange beast that is the on-chip GPU that now and then claims some resources and makes you lose several dozen microseconds. you can just add a level translator. or, simply a resistor, if you don’t need such high speed. The 5V device will understand the 3.3V ok directly. – TTL logic high threshold (VIH min) is 2.0V, so not an issue driven from 3.3V CMOS output. – As for 5V CMOS parts, the threshold is 66% Vcc which is why they pick 3.3V in the first place. If you want more margins, use the 74HCT as that has TTL input threshold. Again, I’m not expecting the CPU to accept 5V, or all the pins on the board. it’s only that if we’re talking about replacing Arduino, which this subthread was about you do need at least one or two pins with 5V input tolerance because a lot of the peripherals are 5V. Arduino users don’t care the slightest what voltage the SDRAM uses. In fact if we’re talking about RAM most of it is driven at 1.8V these days (or 1.1) and you might as well start telling people that all 3.3V hardware is now inherently broken because 1.8V is hip these days. My point being is that transition to 3.3V started well before SDRAM and it is older than some people here. When you are buying new parts or new designs, why bother with 5V at all. Asking them to add parts for 5V tolerant is not fair to the rest that doesn’t care about 5V. Far better off to standardize n 3.3 or lower and have specific level conversion on the peripheral board that needs it. Why even use 5V at all? Where do you get or need 5V? Maybe you should adapt whatever “slave” devices you want to hook up to the Pi, because 5V and high speed/high density electronics do just not mix anymore since the naughties. (With the exception of power+data interfaces like USB, but that is probably a legacy problem they can not fix anymore. USB uses 3.3v for signalling; it provides 5V so there’s enough overhead at the end of a long cable to convert down to a stable 3.3v. Actually the USB standard even drop the 5V tolerant requirement on the USB signals saying that it can save a significant of the chip real estate. They have tried pinching USB cables and found that noe of the test cases would short the I/O to the VUSB rail. If you need 5V tolerant, it is your duty to build that on your circuits, not someone else. I’ve heard that a few times, just throw away whatever peripherals you have, they are flawed if they use 5V. They would mix relatively well if only a few pins on those boards had the buffer resistors or another way to prevent damage to the CPU if 5V input is applied. Like it or not a lot of the Arduino world (which is indeed obsolete from the point of view of modern electronics but is a great prototyping platform for a lot of areas of technology) is 5V, as well as a lot of the RC / drone electronics which is what I want to interface with mostly. Unfortunately, there is no general purpose means of making a non-5V-tolerant pin 5v tolerant, without compromising on something. If you add current limiting resistors, you limit output drive and slew rate. If you add an external level shifter, you can’t use it as an input. If you add a bidirectional level shifter, you compromise on slew rate and high drive current. You fundamentally can’t do timing sensitive stuff from inside a multitasking OS. Some SoCs, like the ones used on the Beaglebone Black, have separate processors for time-sensitive tasks; the RPi doesn’t. You could, perhaps, program it bare-metal without an OS, except for the fact that the broadcom datasheets are NDAed up the wazoo. Or use RISC OS, let it initialize the hardware, and then just never call Wimp_Poll (and then you have the CPU to yourself). You’d think so but if you look at some of the current embedded uses of Raspberry Pi and the BBB they both deal surprisingly well with this timing stuff on both inputs and outputs. See for example the RGB LED drivers or the SBUS, PPM, PWM, etc input and output drivers. They cleverly use the DMA peripheral for all those things and it turns out to work really well, in fact you don’t even need to touch the kernel, userspace does it well enough. Which is all very well until your process goes away for 1000ms because something else is thrashing or swapping, and your emergency stop button stops working. Until a fork bomb happens. Can this play 1080p H.265 HEVC video? I’m eager to find this out as well, i’d suggest waiting for raspi dot tv (alex eames) to make a benchmark. He’s benchmarked all the raspis as they come out, “cpu-power” and “power consumption” alike. But overall, i’d say that if you buy something that tiny … you ain’t using it for 1080p are you? 8-bit HEVC at 720 with nice results using software decoding, but the Pi Zero uses the Pi 1 CPU. It’s got hardware decode support for H264, but not HEVC. Someone may eventually do something clever with the drivers but it will take a while. Wow, the cost is amazing and distributing with the official magazine is a bold move. This could be amazing with several portable projects, as the Raspi A+ already had a power consumption that was ridiculously low, and now this … wow. UK Element14 has them at £11.88 before VAT and shipping, and they are made in Wales! How on earth can they be selling at $5 in the States? Rip-off Britain is alive and thriving! I think something called the “a living wage” has something to do with it instead of sweat shop production. Should have nipped out and got the magazine as it was £5.99. I don’t follow. Are you saying they pay the UK-based employees less when they’re building RPis for the US? My best guess is that to pay a living wage to UK workers, who have a higher expectations of living standards than say China for example, they have to sell them at a higher price somewhere to make the difference. Hence why large scale manufacturing has, generally, moved over seas relative to the UK as cheap labor all but dried up with the increase in expected living standards by the workers. Look at how the working population lived in industrial revolution era and now. We have much higher expectations (and to a point education) of pretty much ever aspect of life compared to then. that doesn’t make sense, all pi’s are made in wales and shipped out of the UK. I wonder how the name “Zero” is going to go over with the Arduino folks? How can they trademark a number? I think Coke’s lawyers would eat both of them if ‘Zero’ was trademarkable. At least in the US, trademarks have categories. And as I understand it, you have to use it in that category you want protection in. So Coke can’t just register tick off the “computing device” category (vague example, probably not the real category name) and use it to fight infringement from “Arduino Zero” or “Pi Zero”. Trademarks are pretty complicated though. Yup. Apple Computer had to sign a promise to Apple Records never to sell music. This came about when the first Macs to have audio in / out were launched. Dunno what they did when Itunes came out. Paid a lot of money, probably. Numbers can be included in a larger trade mark, but that prohibit the use of the number by other manufactures. This is not true. CHIP has a Mali400 GPU on the Allwinner SoC, DDR3, 4GB Storage, bgn wireless and BT4.0. The only thing better spec wise on Pi Zero is the included (mini!)HDMI. CHIP comes with composite only and requires a addon board for VGA or HDMI. Also, availability. If you are lucky, you can get your Raspberry Pi Zero today. Interestingly, the first conspiracy theorists are crawling out of their holes, claiming the Zero to be a reaction to CHIP. They must have no clue about design for manufacturing and product development. A good team like the Pi foundation can dish out faster because they have talented people on a salary, no need for hunt for heads. Chip uses people on a one time cash pay, so over time is not allowed, they are also at the first experience with big scale manifacturing, while Pi deal with it all days. Cheap flash is unreliable and more expensive flash would increase the price too much, you’re better off using an SD card that you can replace if it dies. Use ‘flashhybrid’ package in Debian/raspbian and report back. What people recommend here? is there any first hand experience with them? Cool! What I’d like to see is a power supply and wifi adapter with a fittingly low price. What are the best options today? http://www.andahammer.com/nanopi-2/ for WiFi and BT and LCD drive and all that. Don’t know if USB Ethernet gadget is set up. I am working on some time lapse rigs, thinking about using the normal pi 2. Now with this one, it becomes more attractive. But…i am not saving that much money since i would need adapters and usb hubs. Just bought 2 zero’s and one set of adapters for £14.50 including delivery from pimorini. Shipping was £2.50 so you can get them for a reasonable price with delivery. Whow! fancy new chip, the BCM2845! where can I get one? Is it an 8-core upgrade for the quad core BCM2836? (there is a typo in the article.) . raspberrypi0.com is already taken. It is simply not possible to make this for 5USD. The chip and the board and assembly costs are more than 5USD. I wonder how they do it. Granted , they make it in bulk, But even in runs of 10,000 a four layer board would cost atleast a dollar. Add another dollar for assembly and you have only 3USD for the BOM. I dont really know if this is realistic, but it is a cool initiative nevertheless. 4-layer boards are ~10c/sq in, vs ~6c for 2-layer. The Pi Zero looks to be around 2.5sq in, so about 25c per board. Broadcom’s cost for the 4Gb DDR2 die is likely not much over $1; spot prices on 512×8 DDR3 eTT are between 150 and 175c. The CPU is quite old, made on a 65 or 90nm process. I’d guess it costs broadcom more to package the CPU/RAM than it costs per good CPU die. Based on their previous success, they can probably negotiating prices for 100k (or higher) per year discounts. Sadly there chose to use a 12 year old ARM11 core that implement the 14 year old ARMv6 architecture while all the industry have actively moved to the ARMv7 architecture since already 10 years now. The RaspberryPI 2 with his Cortex-A7 core ARMv7 architecture was a very good move that allow for example to directly use the Debian armhf port. I can’t understand why there are going back with a such obsolete ARMv6 architecture that almost nobody use anymore for a new project. That makes it cheap probably. The market for new applications with this SoC must be non-existing by now. Raspberry pi is not about GNU/Linux it is about a cheap SBC. As long as there is an GNU/Linux distro supported for it there is no matter about the ARM ISA version. It’s right that Linux is not even mentioned as a goal on the Raspberry PI Foundation, but pragmatically I will not be surprised that Linux is used on a vast amount of the Raspberry Pi boards. Maintaining a specific ARMv6 port require a specific effort to be done by someone. Kudos for the community that do this extra work, because from my point of view it’s just a wast of time compared to the ridiculous price difference per chip if a ARMv7 architecture was used, especially since many comments reports that the USD 5 price tag seem to be far from the actual reality. One could arg that the ARMv6 port is still required to support the original Raspberry PI, but I was hopped with the Raspberry PI 2 ARMv7 release that the ARMv6 effort wast will gradually be reduced over time. Now the Raspberry PI Zero only extend the problem for a few more years. The $5 price tag is the only thing making this interesting really. If you’re looking for a small Pi 1 that doesn’t omit the camera port and adds a LiPo power supply and charger you’d better go with the Odroid-W. Sadly yes, Broadcom didn’t want to sell any more chips to the hardkernel guys. In the mean time there still seem to be enough of those in stock. I’ve bought a few just in case. Still, it’s disappointing that they didn’t at least include the option to solder your own camera port. Adafruit out of stock already. Except it will be restocked at all the places that are selling it for $5. It really is $5. I bought mine for $5. An hour ago a guy posted that he walked into a local Micro Center and bought one for $5. Just because someone else raised the price doesn’t change the fact that they really are just $5. I suspect the truth is somewhere in the middle. It won’t be $19.90 because the A+ costs that much (and Micro Center is already selling the B+ for that price). I wouldn’t be surprised if it went up to $9.99 like Micro Center’s pricing for > qty. 1 seems to indicate, though.